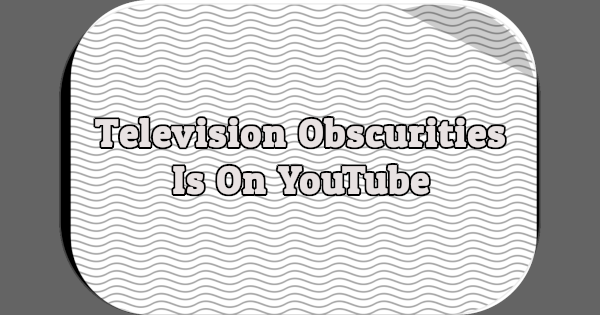 I’m officially announcing the Television Obscurities YouTube channel, where you’ll find opening credits, promotional spots, fall previews, commercials, and much more. At the moment, there are more than 100 videos uploaded and I plan on adding more every week. If you have a YouTube account, please subscribe today. You may recall I posted several test videos last July. After more testing, I “soft launched” the channel on Twitter in December, which is why there are already 80 subscribers. Some of the videos I’ve uploaded to YouTube have been available here at Television Obscurities for years. But very few people watch any of the videos in my articles or my blog. By creating a YouTube channel, I hope to reach many more people. I’ve done the best I can to upload the highest quality videos I can but quality varies dramatically. Some of the videos look marginally better on my computer but after uploading them, whatever additional compression YouTube uses can take a toll. Starting tomorrow, every Sunday I’ll be sharing a video from the Television Obscurities YouTube channel here at my blog. The videos look good! I subscribed, and look forward to videos I haven’t seen yet. Keep up the good work!